ATLANTA — Eddie Hernandez, the award-winning chef and co-owner of the popular Taqueria del Sol restaurants in Georgia and Tennessee, didn’t plan on cooking. At 17, he emigrated from Mexico to play music. “I ate badly, slept little, couldn’t find a girlfriend who believed I was faithful,” he said, laughing. After pursuing the musician’s life for over a decade, he was ready for a change. So Hernandez took a job as a waiter instead at an Atlanta-area restaurant called El Azteca. When he told the managing partner, Mike Klank, — "who's 100 percent American from Memphis, Tennessee," that the Mexican food they served was all wrong, he was put in charge of the kitchen. 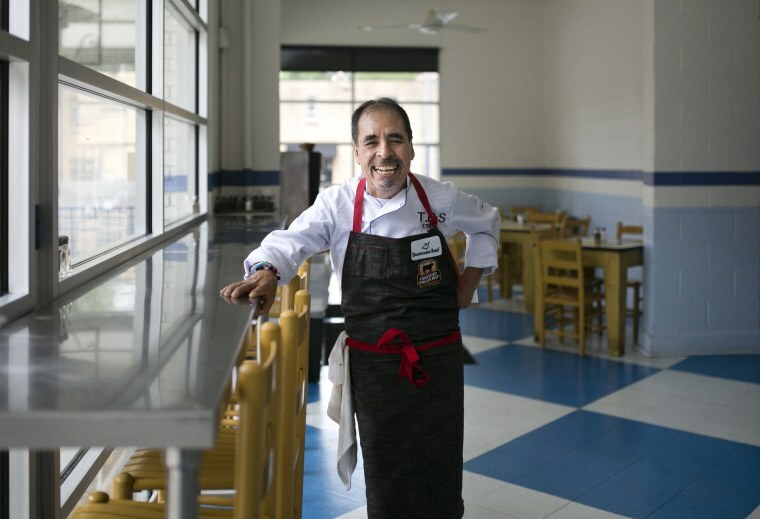 Decades later, Hernandez and Klank have seven locations across Georgia and into Tennessee and they've been nominated for multiple James Beard awards. Hernandez's rise to acclaimed restaurateur may be unique, but not his beginnings in the kitchen — walk into so many of America's restaurants and there's a good chance at least one of the cooks is Latino. As the number of Hispanic cooks rise through the ranks, they're diversifying the restaurant industry and helping redefine the increasingly fusion-style American cuisine. “I realized I could cook in Mexican-style but using ingredients from the South and people responded well,” said Hernandez, now 63, his all-black uniform and overall spikiness speaking to his rock and roll beginnings. Hernandez's rise from cook to restaurant entrepreneur is not uncommon — eight out of ten restaurant owners said they started out in an entry level restaurant job. And as more Latinos have gone through the ranks of the food industry, more have decided to open restaurants — the number of Hispanic-owned restaurant businesses rose 51 percent between 2007 and 2012. The demand for restaurant workers up and down the line is constant, and through different generations, the restaurant industry has been disproportionately dependent on foreign-born workers. And as the demographic wave of the 1990s saw a large wave of Latino immigrants, so have restaurants reflected a larger Hispanic workforce. “Many restaurants are open all day, hotel restaurants are open all day. You need a lot of workforce to make that happen. The entire food industry relies very much, not only on Latinos, but on immigrants,” said chef, restaurateur, and activist José Ándres to NBC News. According to the National Restaurant Association, nearly one-in-four chefs in the U.S. are Latino and about a quarter of the restaurant industry workforce is Hispanic. “Latin Americans from many different countries are the backbone of the operations of a restaurant and in many different capacities,” said Maricel Presilla, the award-winning New Jersey-based restaurateur, culinary historian and author of the Gran Cocina Latina: The Food of Latin America, which won the James Beard award. Presilla is quick to point out that Latinos are not limited to working in Hispanic establishments but thrive in all variety of ethnic restaurants. To illustrate her point, she recalls seeing a help wanted sign pointedly written in Spanish at an Uzbek restaurant on a recent trip to Brighton Beach, in Brooklyn, New York. It’s a story that repeats itself in countless restaurants across the country. “They may come into a job from a lowly position, but, because they tend to be reliable and very eager to learn, they get noticed and they get promoted,” said Presilla. This illustrates the trajectory of Chicago-based sushi chef Roberto Piña, 51. He was still in high school when he took a part-time job at a sushi restaurant just a few years after immigrating to the U.S. from Mexico. As one of the only Spanish speakers at a Japanese restaurant, Piña had a hard time communicating with his colleagues and didn’t care for the work. Eventually, the head chef took him under his wing, and the more he learned about making sushi, the more he enjoyed the process. “It was difficult to adapt to the culture and hard for them to adapt to me. They scolded me a lot but I started liking it so I stayed,” remembered Piña with a laugh. In 1989, Piña landed a job at Midori in Chicago’s northwest side and was promoted to head chef in less than a year, where he works to this day. Piña has passed on his knowledge to other Latinos, now known as susheros. It’s the kind of skepticism Roberto Fernandez, 52, might face if guests of celebrity chef Scott Conant’s Scarpetta knew that their expertly made Italian pasta — tender ravioli stuffed with duck and foie gras and squid ink tagliolini floating in a seafood ragú — was made by a Latino. Fernandez had just arrived to New York from the Dominican Republic and had no restaurant experience when his cousin got him a job at the original Scarpetta in 2008. Fernandez stayed quiet about his lack of experience and memorized the seven varieties of pasta they’d be making, looking up recipes and watching videos on YouTube in his spare time. Fernandez's work in the kitchen took off, and Conant later sent him to help launch the Miami Beach outpost at the Fontainebleau Hotel that same year, where he’s worked ever since. Fernandez chooses to work away from the main kitchen, in the warren-like halls that run underneath the mammoth hotel. Collaborating with head chef Neil O’Connell, he develops new ideas for the menu. Though neither speak the same language, they manage well together. Nina Compton, chef and owner of New Orleans’ Compère Lapin — she won this year’s James Beard Award for best chef in the South — said the restaurant industry has everything to gain when it recognizes the talent and the culinary influences of those working in its own kitchens. “I think that chefs are looking to the staff that are immigrants and using ingredients they never used before — different spices, different preparations — and incorporating that into their menus now, which is very beautiful,” said Compton. For Jose Ándres, the fact that so many restaurant workers are immigrants presents a chance for restaurateurs and those in the industry to innovate and adapt. For Atlanta's Eddie Hernandez, his creativity has been recognized nationally by the culinary elite — he and Clank have been nominated for multiple James Beard restaurant awards and Hernandez published his first cookbook, Turnip Greens & Tortillas: A Mexican Chef Spices Up the Southern Kitchen this past spring. The eponymous turnip greens are prepared like Mexican quelites and the chicken pot pie is poured into a puffed tortilla shell. The cover features a taco slathered with barbecue sauce spiked with chile de árbol and jalapeños in vinegar with coleslaw. His cooking, with its fusion of different cultures and foods, is quintessentially American. “The object was always to retain the essence of who you are but to advance the culture where you’re living and to be a part of it.” said Hernandez.